We're finishing off a paper which should be out in the next couple of days, I'll link to it when we're done - this has been a fun project and there's lots more to be done on this subject. In the mean time a photograph from yesterday. While I still can't do much photography with a dodgy eye, I was able to hook up the tripod and the macro lens as the sun was setting to get an alternative version of this wonderful effect. This is multiple sunsets, refracted and inverted through the dew on my West facing window - In fact it's three photos taken at different exposures and overlayed. Click through for more detail and much larger sizes. 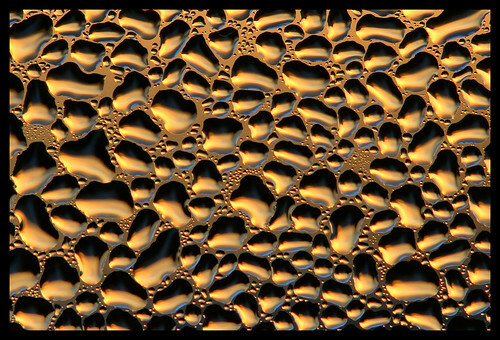 i had meant to tell you that this image is like an illusion... you can't tell if the drops are concave or convex.